The first day of school. The first daffodil poking its head through the winter-hardened earth. The first summer peach. I love the “firsts” that signal the start of something new—the changing seasons, the turning of the calendar, one rhythm giving way to another. Today is one of my favorite “firsts”: Opening Day. Sometime around midday, the Washington Nationals will don crisp white uniforms. Each player will be introduced, emerging from the home dugout one at a time to form a less-than-military-precision line between home plate and first base. A ceremonial baseball will be tossed, flags will fly, and thousands upon thousands of hot dogs and “curly W” pretzels will be consumed. 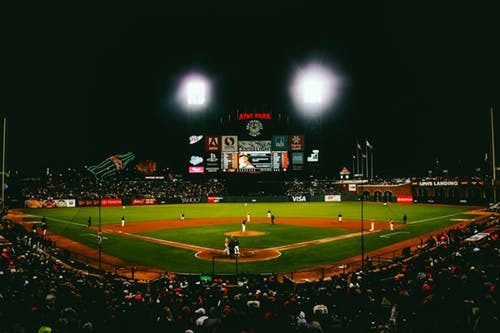 Finally, the magic words, “Play ball!” will be shouted over the public address system, and the team will storm the baseball diamond for the first day of the 2019 season. One of the reasons I enjoy following the Nationals is that I find so many metaphors for life in the world of sports. According to their manager, during spring training the Nats have been focused on “fundamentals.” In baseball terms, that means paying attention to the nitty-gritty details—where one’s feet should be to turn a double-play, how to bunt, getting to know which side of the bag a teammate prefers to receive the ball. It means practicing the same things over and over again each day until they become routine. It is exactly the same in so many areas of our lives. In terms of health, I, too, need to pay attention to the details—am I drinking enough water? How much sugar have I had? What will my exercise be and for how long? Have I had the five servings of fruits and vegetables I need? If health is something I really value, then I will keep track of these “fundamentals,” because I won’t stay healthy without conscious, active, daily choice. Think about relationships. Kindness is fundamental to good and healthy relationships. So, we practice kindness in what we do and say for others. We put their needs ahead of our own. We generously share our time to help someone, not because we expect something in return but because we value intimate and loving connection. We won’t always feel like being kind, but I bet Ryan Zimmerman doesn’t always feel like staying in the batting cage for hours to practice his swing, either. Yet, if he wants to be a premier baseball player, he does it anyway. If we want premier relationships, we will practice kindness even when it’s not convenient or easy. And the same principle applies spiritually, as well. If a vibrant faith and deep relationship with God is something I value, there are fundamentals I will practice until they become routine: prayer, meditation or journaling, reading or memorizing scripture, serving others, and worshiping regularly with a faith community. These spiritual practices are as vital to faith as a baseball pitcher tossing the tens of thousands of pitches that are necessary to hone his skill and make a Big League roster. The truth about what is most important to us is revealed by our actions. We can’t talk our way to good health, intimate relationships or deep faith any more than Max Scherzer can talk his way to a Cy Young award. We have to practice the fundamentals. Come to think of it, wouldn’t Spring Training for people of faith be just the ticket?